The incident will always be fresh in my mind. I had been a practicing devotee for ten years, eight of which were in the sacred holy land of Sri Dham Mayapur in India. Little did I know that Krishna would be sending me the test of my life, the test of chanting His holy names. As had been the routine since 1979 when devotees from Mayapur had inaugurated the Nama Hatta preaching by introducing the chanting of the holy name in every town and village, as ordered by Lord Caitanya Mahaprabhu, I had just returned from such a village preaching engagement in the month of March, 1984. I had joined the Hare Krishna Movement exactly 10 years earlier, January 1974, in the capital city of Ottawa. After serving in Ottawa for two years, Krishna had arranged that I travel to India to attend the yearly Gaura Purnima Festival that takes place in the month of February/March. While serving in Ottawa as the head-cook for close to two years, the chance to visit the birthplace of Lord Caitanya, that very personality who had inaugurated the chanting of the holy names in this same Sri Dham Mayapur some 500 years earlier, had come upon three young brahmacaris serving at the Ottawa temple. By some divine arrangement, I was able to continue serving in India since that first visit in March of 1976. Just a few days before the Gaura Purnima festival in March 1984, during the annual GBC meetings conducted earlier in the month, I had been recommended to take sannyasa and, as was the custom in those earlier days, I was to take sannyasa the next year, Gaura Purnima of 1985. Soon after the GBC meetings, we prepared ourselves to receive the hundreds of devotees arriving from different parts of the world. One of my regular duties during each Gaura Purnima festival was to receive and register devotees at the Reception Office, assigning them rooms and giving out prasadam coupons. We had no computers in those days and all the work was done by hand in one main ledger, a time consuming and tedious task. By law, the local Foreign Registration Office (FRO) requires all foreigners visiting India to officially register following a special Proforma. Devotees in those earlier days would travel by large groups from different countries to converge at the Dum Dum Airport in Kolkata and would then take buses (as many as 10 to 15 buses or more) to travel, caravan style, to the mystical land of Sri Dham Mayapur. My first experience in 1976 of travelling to Mayapur in this way was a memorable one and all new comers to the annual Gaura Purnima Festival have a similar experience. This meant that hundreds of devotees had to be registered at one time, following the slow system used in most government offices, i.e. without using computers. Needless to say this was taxing on both those who had to register and the person doing the registration, namely me. Immediately after the devotees left Mayapur to visit Vrindavana, wanting to take a break from those pressured days, I had travelled to some Nam Hatta village in the district of Birbhum, close to Ekachakra, the birthplace of Lord Caitanya’s closest associate, Lord Nityananda Prabhu. The visit was very short and within a few days, I returned to Sri Mayapur. Most of the rooms where visiting devotees had just left for Vrindavana a few days earlier, were still not cleaned and had remained open. Feeling tired from the long travel that day, instead of sleeping in my regular quarters located in the basement of the Cakra Building where we had no fans, I went to the second floor of the building and chose one of the open rooms, all of which had two fans. I was taking rest very peacefully when all of a sudden I heard some tumultuous sounds coming from the temple side. Still half asleep, I walked over to the balcony to observe large sparks of light flashing in the dark night. I looked at my watch and it was 12:30 am. The loud thundering sound continued and I could understand that these were bomb blasts. Our temple was being attacked! As I was standing on the balcony, I would also hear large cries from devotees. Suddenly, a group of devotees, possibly 20 strong, rushed from the Chakra Building to the Lotus Building where the temple was located. As they ran up the stairs, they became baffled to see the gate locked. Fortunately they were able to climb inside the building by bypassing the locked gate. Naturally, I wanted to also get involved so I ran downstairs to my room in the Nam Hatta section of the basement. A few devotees were still in some of the rooms, no one really knowing what to do. 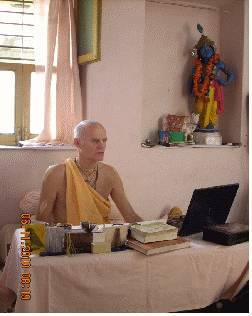 One new person who had stayed in one of the Gaudiya Maths was urging the devotees to lock themselves inside their rooms and not venture out. I gathered a few devotees together and taking my padlock from the door and two walking sticks in my room, lead the devotees towards the backside of the Lotus Building where all the fireworks were still going on. As we turned the corner of the Lotus Building, we could hear loud sounds in the temple area. In my mind I was convinced that the devotees were fighting it out with dacoits and surely needed some help. Passing by a pile of bricks lying close-by, I exchanged my padlock for a larger weapon, a brick. As we all ran from that corner of the building towards the only gate open to enter the temple, I held in my right hand the brick and in my left hand the two walking sticks which I wanted to use as latti or fighting sticks. I was leading the group of some seven devotees toward that gate where I could see one person guarding it. As I approached the gate, another person appeared at the gate. It was very dark. I could not clearly see what this second person was doing. It seemed as if he was waving his hands warning me not to come closer, which indeed he was doing, but little did I know that he was actually preparing to throw a bomb in my direction. As things happen in most unexpected accidents, the bomb made a huge sound upon hitting my body as it exploded. Upon contact with the bomb, my body flew a few feet in the air and I suddenly found myself crashing on the ground, flat on my back, suddenly realizing that a bomb had hit me. My arm had spontaneously reached my right leg where my knee bone was sticking out and blood was bleeding profusely. I had remained conscious from the moment I was hit by the bomb and the first reaction was to loudly start chanting the Hare Krishna Maha-mantra. I can recollect chanting very clearly and very loudly. I felt no pain but rather was experiencing a type of calm and serenity that took me beyond the bodily platform. The fighting was still raging inside the temple and I had no idea how long the whole ordeal would last. I also had no idea if I would survive the injury since I knew I was losing a lot of blood, my extended right hand and arm feeling the hot sulfur used in making the cocktail bomb. But as I lay on my back in that somewhat precarious condition, I realized that chanting the holy name had become a spontaneous reaction and I was feeling great comfort in simply taking shelter of the holy names. I was mentally prepared to leave my body if that was Krishna’s desire. I occasionally share this experience with devotees as it further deepened my conviction that the chanting of the holy names can bring solace and comfort to one who may be in the most precarious of conditions. I have heard similar accounts from devotees having similar experiences. Chanting the holy names of Krishna really does work. Hare Krishna.